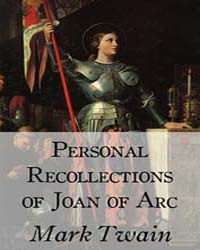 Description: Mark Twain's work on Joan of Arc is titled in full Personal Recollections of Joan of Arc, by the Sieur Louis de Conte who is identified further as Joan's page and secretary. The work is fictionally presented as a translation from the manuscript by Jean Francois Alden, or, in the words of the published book, Freely Translated out of the Ancient French into Modern English from the Original Unpublished Manuscript in the National Archives of France. De Conte is a fictionalized version of Joan of Arc's page Louis de Contes, and provides narrative unity to the story. He is presented as an individual who was with Joan during the three major phases of her life - as a youth in Domremy, as the commander of Charles' army on military campaign, and as a defendant at the trial in Rouen. The book is presented as a translation by Alden of de Conte's memoirs, written in his later years for the benefit of his descendants.